One of my favorite things to include in the Wee Warhols art classes is action art! We like to include movement when creating art. Kids don’t want to sit still. They don’t want to be confined to a chair in a classroom. So, we like to paint with fly swatters, and wind up toys, or remote control cars… Some times we use small motor skills, sometimes we use large motor skills, but we like to move. I am greatly inspired by MaryAnn F. Kohl -Action Art and Jean Van’t Hul- Artful Parent. You can find so many fun activities in their books. Both books are essential must haves, for any parent or art teacher’s library. 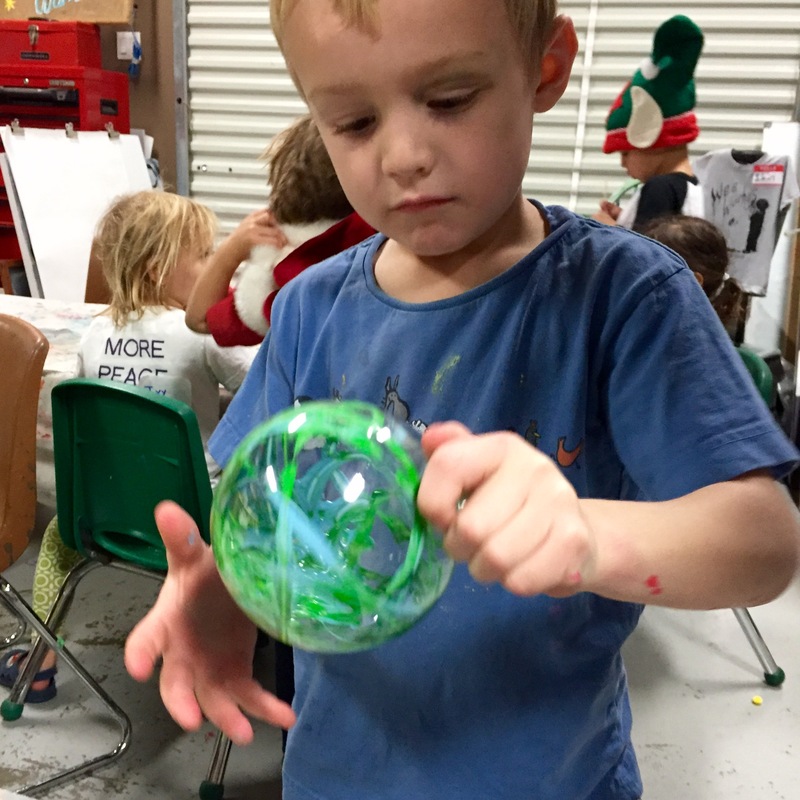 During our Wee Warhols Holiday Workshop we incorporated action art by using marble rolling in plastic ornaments. I found large acrylic clear bulbs at Walmart for 98 cents each, but you can find them at any craft store around Christmas time. You could use glass ones, but you would have to be much more careful with slower movements. To start, I let everyone have a bulb with a marble in it, so they could get a feel for it and get their crazies out before adding paint. Then I picked them all up so we could get started. I had the children choose one or two paint colors of enamel or multi-surface acrylic paint. 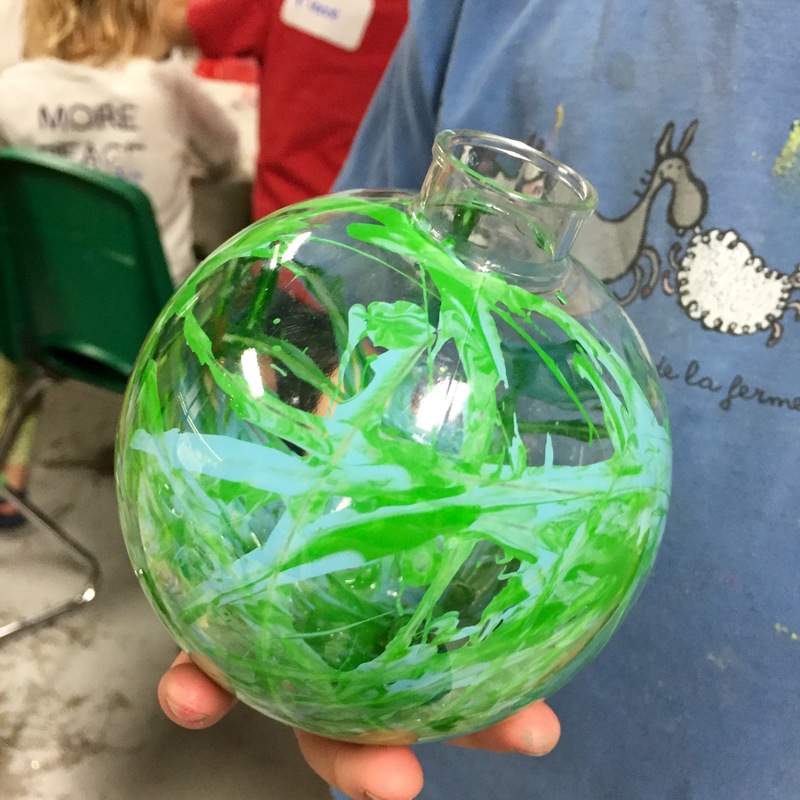 We squirt a little paint in the bulb, then they added a marble and got to swirling. This was a good color mixing lesson for the ones that choose two colors. We talked about what color the combo would make. We observed that if you went really fast and kept going, the marble would color the whole inside of the bulb. If they went slow and short, you could see the tracks better. When they were pleased with the result they dumped the marble out in a strainer. Getting the tops of the ornaments back on can be tricky for younger children, so my assistants and I helped with that. This was a fun action art holiday project studying movement. You could always add glitter or glitter paint to make them sparkle. Have you purchased your copy of STEAM KIDS CHRISTMAS yet?